Here's an interesting fact: The income per household member is higher for people over age 65 compared to the amount for households under age 65. The income per household member for people age 65 or old is $28,330. For households under age 65 the income per household member is $27,152. I previously rote about retiree income levels and pointed out that "Median household income for people over 65 years is just $33,118 compared to a median of $50,054 for the entire population." But households for people over 65 generally have fewer people in them so the income per household member is higher than the general population of people under 65. Households over age 65 average about 1.77 people while households under age 65 average 2.77 people. Median income of $33,118 for people over 65 seems bad compared to median income of $50,054 for households under 65 but its not so bad when you keep in mind that the households over 65 have 1 fewer people to support. 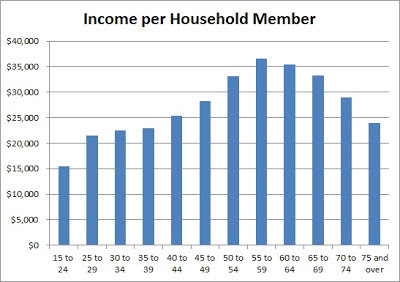 The numbers for income per household member are all average figures so they are skewed higher by the people with high earnings. If you look at the income levels per household member the difference between people in their peak working years and the retirees isn't so drastic. Income levels per household member for older retirees over 75 years old is significantly less than the peak earning years of 55 to 59. I assume the drop off in incomes for people over 75 is due to people whos pension or retirement benefits haven't kept up with inflation or whos other incomes have dwindled.